But be forewarned–wading into this fray might set your head to spinning. Both sides claim that science is on their side. Many commenters–those clamoring for trophy hunting–consistently call for management to be turned over to the states in what is certainly an orchestrated campaign by hunting groups. Bears have lost their fear of humans, and hunting will fix that is another theme. A cattle association president bellyaches about “calf loss rates” due to grizzlies on national forest grazing allotments–the very same citizen-owned public lands that native grizzlies should have uncontested access to. Remember Bear 399? You got acquainted with this special griz in “Bear 399: Delisting the grizzly you know.” The arguments against the premature delisting proposal are all laid out there: critical changes in food supply; habitat expansion and connectivity obstacles; immediate trophy hunting; too many conflict-related mortalities; and one that I failed to mention in that post (super-mom 399 notwithstanding)–“grizzly bears have one of the slowest reproductive rates among terrestrial mammals, due to their late age of first reproduction, small average litter size, and the long interval between litters: it may take a single female 10 years to replace herself in a population” (source). A list of good resources is also attached to that post. Everything needed to make a decent, succinct comment is there. Will our comments against delisting change anything? Probably not. But let the final tally show that more people were selflessly concerned with species survival than with bragging rights to taxidermy mounts and bearskin rugs. I hold in my imagination the beautiful image of a human mom pointing out to her awe-struck kids the sight of a grizzly mom tending her own kids as she attempts to make her way through a human-dominated world that holds both wonder and respect for her life…and bullets for her death. Endangered and Threatened Wildlife and Plants: Removing the Greater Yellowstone Ecosystem Population of Grizzly Bears From the Federal List of Endangered and Threatened Wildlife, here. Includes link to docket folder, summary, and extensive supplementary and background information. Docket folder summary: Includes a few comments, a link to “view all” comments, and a “comment now” button for your own two cents. “Blaze” & cub in 2011; Amy Gerber photo. Click image for more photos. A 63-year-old male hiker is dead, killed and partially consumed by a grizzly bear while hiking in Yellowstone National Park. 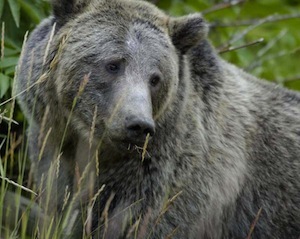 A 259-pound mother grizzly, who was at least 15 years old, is also dead, killed by the caretakers of her home in Yellowstone National Park. Her two female cubs-of-the-year, likely seven or eight months old, are dead insofar as their ability to live wild, free-ranging lives goes; they’ve been shipped off to the Toledo Zoo for lifetime incarceration. Apparently, those darn grizzly bears are putting our nation at risk. 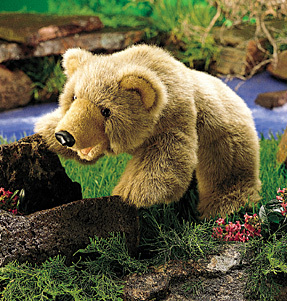 Noting darkly that “the threat from the north is real,” a group of Republican lawmakers are concerned that grizzlies and other transboundary species are interfering with the Department of Homeland Security’s ability to protect the motherland.